If you grow soybeans and have had all or either of Canada fleabane, common ragweed and giant ragweed growing in your fields, the use of pre-plant herbicide tank-mixes will be your best chance at achieving good control of these weeds. Management options for these three weeds are either limited or do not provide acceptable control once the soybean crop has emerged. Why are these weeds so difficult to manage? 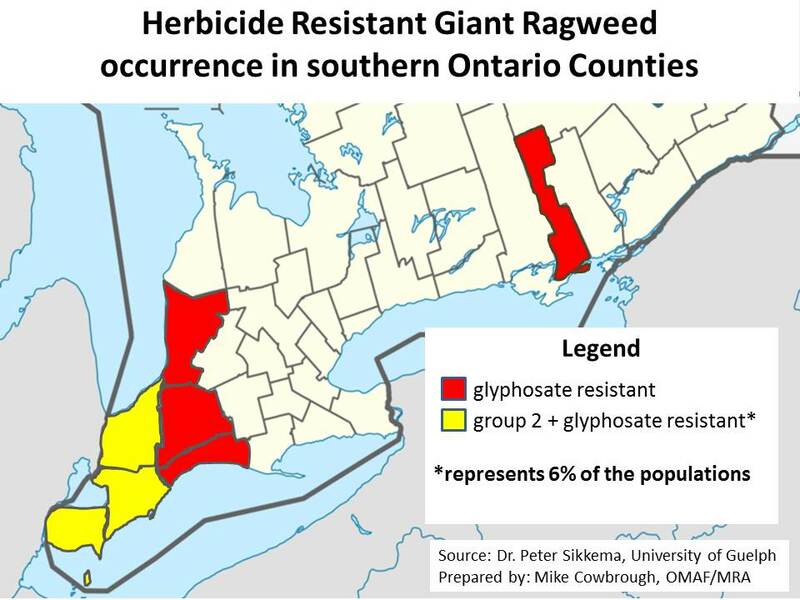 Populations of all three species exist in Ontario that are resistant to glyphosate. In addition there are also populations of Canada fleabane and giant ragweed resistant to FirstRate (cloransulam) and Classic (chlorimuron). 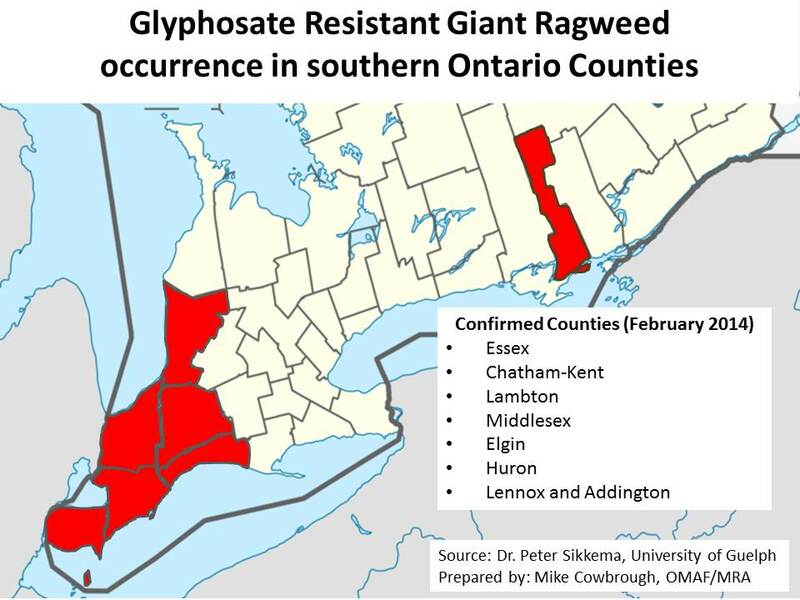 12% of confirmed glyphosate resistant sites in Ontario were also resistant to “group 2” herbicides (e.g. FirstRate). See figure below. Majority of seeds (~80%) will germinate upon dispersal. Seeds are air born and will move several hundred metres. 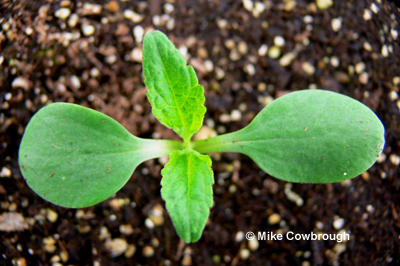 A small seedling fleabane plant shown in late August, 2011 that germinated after cereal harvest. 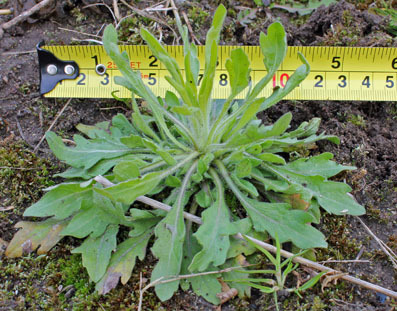 Canada fleabane size on May 24th, 2011. This is beyond the ideal stage to effectively manage with either herbicides or tillage. Table 1: Visual control of glyphosate resistant Canada fleabane when herbicides with different modes of action were tank-mixed with glyphosate and applied prior to planting soybean. 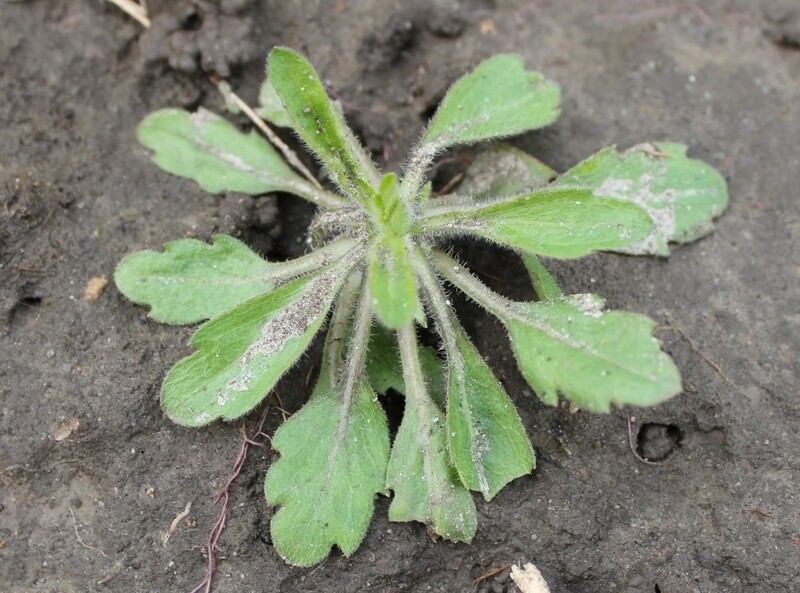 * populations of Canada fleabane are also resistant to this herbicide. I heard Sencor (metribuzin) was effective on fleabane, how come its not included in the above table? 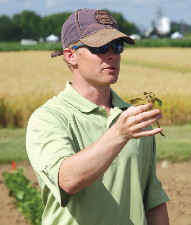 The 600 g/acre rate of Sencor 75DF (metribuzin) provided exceptional control in Dr. Sikkema’s trials. However, this is the highest label rate and can cause significant crop injury and yield loss if used on high risk soils (low organic matter, coarse textured). 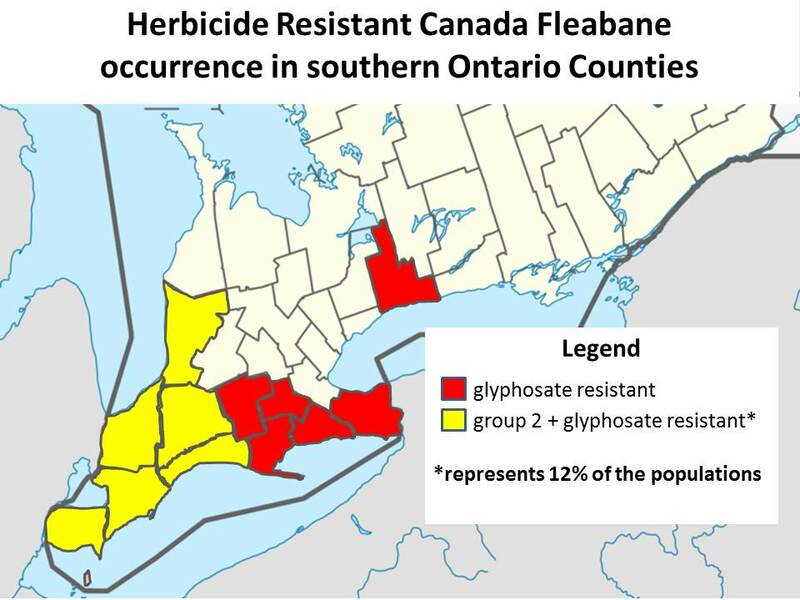 Efficacy of Canada fleabane with lower rates of metribuzin have not been evaluated in Ontario. However, Eubank et al., 2008 used the equivalent of 225 g/acre of Sencor 75DF and observed Canada fleabane control that ranged from 53-73%. 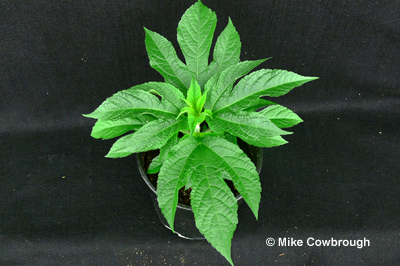 A 2 leaf giant ragweed seedlng. 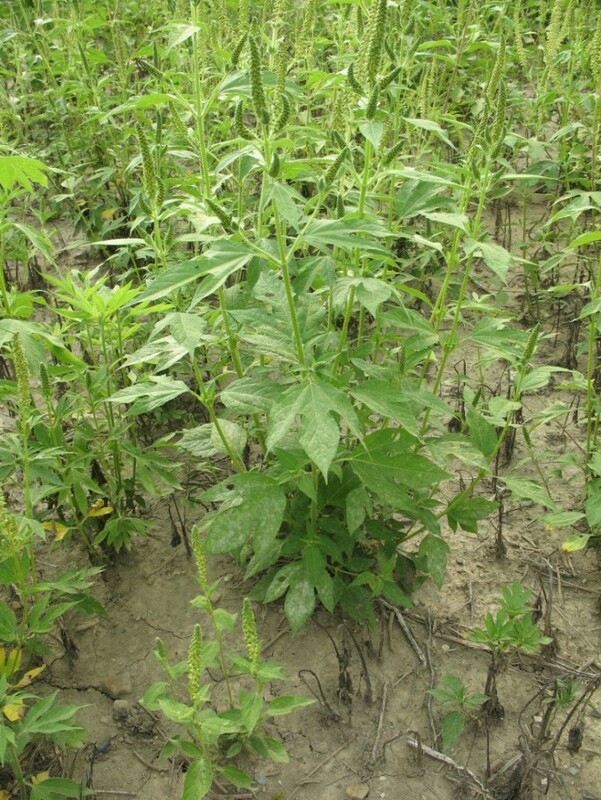 A giant ragweed plant past the ideal stage for control with a herbicide. 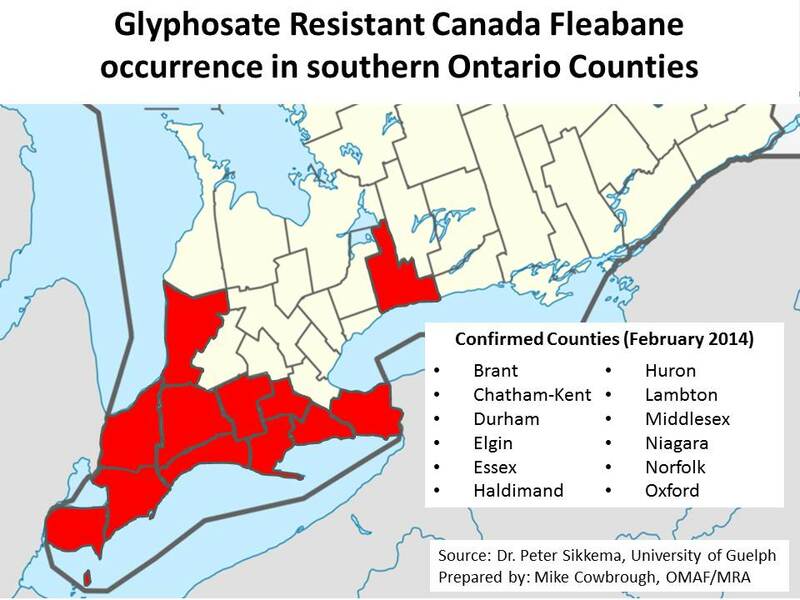 6% of confirmed glyphosate resistant sites in Ontario were also resistant to “group 2” herbicides (e.g. FirstRate). See figure below. Considered one of the most competitive species in Ontario. Female plants (seed producing) are wind pollinated by male plants. Wind born pollen can travel several kilometers. Table 2: Visual control of glyphosate resistant giant ragweed when herbicides with different modes of action were tank-mixed with glyphosate and applied prior to planting soybean. * populations of giant ragweed are also resistant to this herbicide. ACKNOWLEDGEMENTS: The research conducted by Dr. Sikkema’s lab could not have been done without the assistance of Chris Kramer (research technician), along with current and former graduate students. Specifically: Holly Byker, Laura Ford, Joanna Follings and Joe Vink. Funding for this project was provided by the Agricultural Adaptation Council, Monsanto Canada and the Grain Farmers of Ontario.